Meng Wanzhou, CFO of Huawei and daughter of the company’s founder, was arrested in Canada last month. It’s alleged Wanzhou aided Huawei in flouting US sanctions against Iran by lying about the companies relationship with two subsidiaries. Huawei said it did not commit "the asserted violations" and "is not aware of any wrongdoing by Ms Meng". Sanctions against Iran were reinstated after the US pulled out from a 2015 nuclear deal over claims Tehran was not complying. Even stricter measures were recently implemented targeted at Iran’s oil exports, banks, and shipping. A breakdown in the relationship between the US and China over its trading relationship, leading to high tariffs on each other’s goods, is said to be part of the reason behind such a hardline stance against Huawei. The next allegation is with regards to a technology called ‘Tappy’ by T-Mobile which mimics human fingers to test a smartphone’s durability. 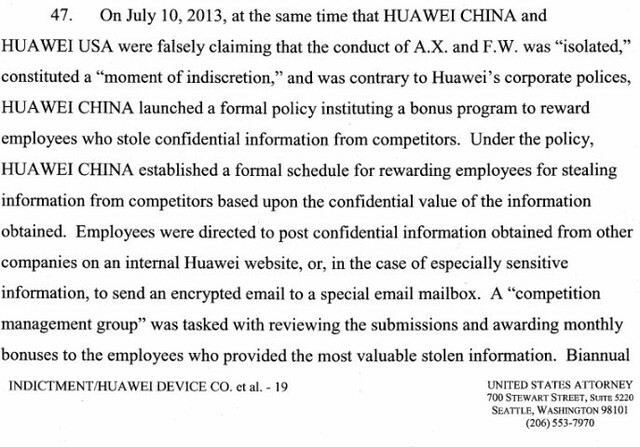 Huawei is alleged to have stolen the technology in addition to obstructing justice and committing wire fraud. During a 2015 tour of Huawei’s facilities in China, Telecoms spotted a test which consisted of a finger-sized stylus which constantly tapped and swiped randomly. While unconfirmed to be T-Mobile’s allegedly stolen technology, it appeared similar. Your humble Telecoms editor attempted to film the test but was promptly told no recordings were allowed. Huawei’s devices go through rigorous and impressive durability tests so it was a shame not to get footage, but it now seems plausible there were other reasons. Huawei said it settled the dispute with T-Mobile over Tappy in a civil case filed in 2014. America has been petitioning its allies to ditch Chinese 5G equipment over national security fears. Some reports suggest officials have even offered incentives to use Western alternatives. “We should all be concerned by the potential for any company beholden to a foreign government—especially one that doesn’t share our values—to burrow into the American telecommunications market,” continued Wray. Wang Weijing, a Huawei employee, was arrested in Poland earlier this month on spying allegations. A spokesperson for the country’s Internal Security Agency said the allegations against Wang were related to individual actions not directly linked to Huawei. Huawei maintains it’s not beholden to the Chinese government and that it would not be compelled to conduct attacks on foreign networks upon request. Last month, an exec for Huawei Canada said allegations it would conduct espionage makes no sense as the distrust caused would be terminal for its business. Potential national bans have led some companies to stop purchasing Huawei equipment. During a briefing in Beijing, government spokesperson Geng Shuang said there were "political motivations" behind US attempts to "smear and suppress certain Chinese companies". The US has filed 23 charges in total against Huawei.